Snellen visual acuity was developed at a time when the only possible refractive correction of the optical system of the eye was spherocylindrical glasses and the surgical techniques of treating eye diseases were less advanced. The 20/20 Snellen visual acuity was considered normal vision and the goal of treatments and surgeries. This measurement of visual function does not suffice for a full understanding of quality of vision, nor is it adequate for the current clinical practice of refractive surgery. Many people have visual acuity that is better than 20/20, and real-world visual performance also includes low-contrast objects under low or high illumination. In physics, light can be described as either a wave or a particle. In the wave theory, all points of light that originate from the same point source and that are oscillating in the same state or phase are termed a "wavefront." When a wavefront of light travels through a vacuum, there is nothing to cause it to refract and scatter. Therefore, it has no imperfections or distortions. This does not happen in the real world, where even the atmosphere that light passes through modifies its path. In ophthalmology, the eye is viewed as an optical system. A wavefront of parallel beams of light enters the eye and is distorted by the refractive error and imperfections of the eye's optical system. The total wavefront error is the difference between an ideal perfect wavefront and the actual real wavefront of the eye and gives an idea of the total distortion in the eye. Imperfections in the ocular system impair quality of vision. Wavefront describes the curve corresponding to the position of multiple light rays exiting the eye that passed the different spots in the area of the pupil, emanating from the point source in the foveola after it passes through the optical system of the eye. The local slope of the wavefront curve at the particular spot within the pupil is derived from the actual image displacement of the point source from foveola as it passes through the optical system of the eye as compared to the ideal/predicted image of the ideal optical system. All the rays from an object that are entering the eye with an ideal optical system should focus in the foveola. If it is presumed (that is not entirely true) that the light travels to the eye the same way as out of the eye, the wavefront directly measures the aberrations of the eye. Ideal wavefront of an optical system with no aberrations in place. Light with short wavelength (blue) bends more than the longer wavelength (red). If yellow light focuses in the foveola, the blue and red lights focus in front of and behind of the foveola, respectively. This is the basis of the red/green refractive test in clinical practice. This type of aberration currently cannot be corrected by any procedure. Wavefront analysis instruments do not analyze degradation of the image caused by the chromatic aberrations. Diffraction is an example of the properties of light, which is explained by the wave theory of light. When the wave encounters an obstruction, an aperture diffraction changes the direction of the wave. The image formed on the retina from the light entering through the pupil is not a perfect point but a light disc (airy disc) surrounded by concentric dark and light rings. Longer wavelengths (red) diffract more and, therefore, form a larger diameter airy disc. The diffraction cannot be eliminated by changing the shape of refractive surfaces as is completed with laser vision correction. The resolution of optical systems is limited by diffraction. If any optical system is within one-quarter wavelength of being perfect (Rayleigh criterion) further improvement of the optical system will not result in significantly better resolution of the optical system. The aberrations caused by diffraction in the eye under usual conditions tend to be very small. When the pupil size is smaller than 2.5 mm, the diffraction increases and sets a limit for visual acuity. Clinical terms of spherical correction, astigmatism, spherical aberration, and coma are all monochromatic aberrations. Total monochromatic aberrations correspond to the shape deformation of the wavefront. Monochromatic aberrations can be decomposed into Zernike polynomials (ZP) consisting of Zernike terms (ZT). Each term ZT of ZP corresponds to a specific geometric pattern of the aberration (eg, ZT3 = astigmatism). The number (eg, ZT3 = 0.4) next to the particular term (eg, term ZT3) describes the amount of this particular type of aberration present. Zernike terms are grouped into orders of ZP (second order ZP are terms 3, 4, 5). These are mathematical expressions describing how much of what type of geometrical pattern (each term of ZP) is contributing to the total optical (wavefront) aberration. This can be thought of in a similar way, as any curve (function) in geometry can be mathematically approximated with a polynomial function (ie, a function y = a + bx2 +cx3 + dx4 + …). Other mathematical methods of analyzing the total optical aberrations are possible, but the decomposition to ZP became commonly used and will likely develop into a standard way of reporting aberrations. The classic spherocylindrical correction of refractive errors that correct the optical aberration of defocus equals spherical correction (Zernike term 4) and astigmatism (ZT 3 and 5) are familiar. The so-called higher order aberrations are all the other aberrations except defocus (ZT4) and astigmatism (ZT3, 5) combined. In normal human eyes of young patients, third order ZP aberrations (ZPA) are responsible for approximately 40%, fourth order ZPA for 25%, and fifth to sixth order ZPA for 30% of higher order aberrations of the eye. Point spread function (PSF) is a measure of how well one object point is imaged on the retina through the optical system of the eye. The PSF and image of an ideal optical system of the eye is zero (a point in the foveola). Root means square (RMS), also called the RMS of the optical path difference (OPD), in micrometers, is a measure of the deviation of an actual image from an ideal image of the source point object. The RMS of an ideal optical system is zero. The total RMS of the average human eye is 0.1 µm at younger than 40 years to 0.25 µm at age 60 years. Standard LASIK increases the RMS several times especially with larger pupil sizes. The RMS of high-quality telescope or microscope is less than 0.1µm, while the RMS of most cameras is several times higher. Modulation transfer function (MTF) is a set of numbers from 0-1, which characterizes the degradation caused by the tested optical system (eg, human eye), where 1 is a perfect optical system with no degradation of the image and for numbers close to 0, the image cannot be discerned at all. The Snellen letters used for testing of visual acuity are high-contrast targets of standard width, and they do reflect the ability of human eyes to read letters but do not characterize the visual performance in different real-world conditions well. The target often used to test the performance of optical systems (eg, microscopes) is a series of alternating light and dark bars of equal width or even more often its modification, where the brightness of the dark and light areas are changing in the form of the sine wave. The sine wave describes the testing object. This concept is used in ophthalmology in contrast sensitivity testing. The particular sine wave is characterized by the spatial frequency in cycles per millimeters. Cycle is the width of the dark and light areas together similarly as frequency characterizes the sine wave in math. Modulation is a number from 0-1, which characterizes the relative height of the sine wave. Modulation close to 1 characterizes high-contrast where the differences between the dark and light areas can be observed readily, while the modulation of 0.03 is close to the limit of visual detection of the dark and light area by the human eye. A sine wave pattern with modulation of much less than 0.03 appears as grey to the human eye and dark and light areas cannot be distinguished. MTF plots a number from 0-1 (modulation), which characterizes the degradation of the image for every spatial frequency of the object sine wave. The testing object sine wave is degraded by the tested optical system to another sine wave characterizing the image. MTF of 1 describes a perfect optical system with no degradation. A sine wave with MTF close to 0 completely degrades the image, so it cannot be distinguished. Light of specific characteristics is projected into the eye onto the macula. Rays that emerges from a single point in the foveola and pass through the optical system of the eye are analyzed. Multiple tiny lenslets in newer devices simulate apertures in the Hartmann disc located in front of the eye that isolate a narrow pencil of light emerging through different parts of the pupil. A charge-coupled device (CCD) camera registers the true position of each ray and compares it to the calculated reference position of such a ray for a perfect optical system of the eye without aberrations. This difference enables calculation of the aberrations of the true optical system of the eye. Examples of these devices are Wavefront analyzer made by Adaptive Optics, 20/10 Wavefront system by VISX, Wavefront analyzer made by Humphrey/Zeiss and Alcon/Summit/Autonomous, and Bausch & Lomb aberrometer based on Technolas design. The images below sample show wavefront maps. Zywave total and higher order wavefront (WF) map. Higher order WF showing vertical coma. Zywave individual Zernike terms. Elevated vertical coma. Tscherning aberrometry analyzes the ingoing light, which forms an image on the retina. A grid pattern formed by multiple spots is projected through the optical system of the eye and forms an image on the retina. This image is observed and evaluated by a method similar to indirect ophthalmoscopy and captured on CCD camera. The distortion of the grid pattern enables calculation of the aberrations of the optical system of the eye. Tscherning aberrometry is used in Dresdner Wavefront Analyzer distributed by Technomed, Wavelight, and Schwind. This device measures an ingoing light that passes through the optical system of the eye and forms an image on the retina. It measures one ray at a time in the entrance pupil rather than measuring all the rays at the same time like previously mentioned devices. This decreases the chance of crossing the rays in highly aberrated eyes. The total time of scanning is 10-40 milliseconds. Ray tracing aberrometry is used in TraceyScan distributed by Tracey Technologies. Scanning slit refractometer is based on retinoscopic principles. Both the projecting system consisting of an infrared light source and the receiving system rotate at high speed around the optical axis synchronously, and 360° meridians are measured in 0.4 seconds. A group of photodetectors is located above and below the optical axis at 2.0, 3.2, 4.4, and 5.5 mm, which detect the time of its stimulation by reflected light. The time difference depends on the type and amount of refractive error and is converted into the refractive power. Fong CS. 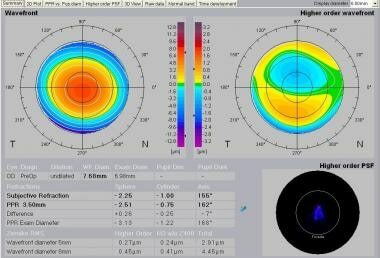 Refractive surgery: the future of perfect vision?. Singapore Med J. 2007 Aug. 48(8):709-18; quiz 719. [Medline]. Campbell C. The effect of tear film on higher order corrections applied to the corneal surface during wavefront-guided refractive surgery. J Refract Surg. 2005 Sep-Oct. 21(5):S519-24. [Medline]. Neuhann T, Neuhann IM, Hassel JM. Aspheric profiles for refractive laser ablation of the cornea. Ophthalmologe. 2008 Mar. 105(3):241-7. [Medline]. Diaz-Douton F, Benito A, Pujol J. Comparison of the retinal image quality with a Hartmann-Shack wavefront sensor and a double-pass instrument. Invest Ophthalmol Vis Sci. 2006 Apr. 47(4):1710-6. [Medline]. Atchison DA, Scott DH, Charman WN. Measuring ocular aberrations in the peripheral visual field using Hartmann-Shack aberrometry. J Opt Soc Am A Opt Image Sci Vis. 2007 Sep. 24(9):2963-73. [Medline]. Warden L, Liu Y, Binder PS, Dreher AW, Sverdrup L. Performance of a new binocular wavefront aberrometer based on a self-imaging diffractive sensor. J Refract Surg. 2008. Feb; 24(2):188-96. [Medline]. Mrochen M, Kaemmerer M, Mierdel P, et al. Principles of Tscherning aberrometry. J Refract Surg. 2000 Sep-Oct. 16(5):S570-1. [Medline]. Molebny VV, Panagopoulou SI, Molebny SV, et al. Principles of ray tracing aberrometry. J Refract Surg. 2000 Sep-Oct. 16(5):S572-5. [Medline]. MacRae S, Fujieda M. Slit skiascopic-guided ablation using the Nidek laser. J Refract Surg. 2000 Sep-Oct. 16(5):S576-80. [Medline]. Rozema JJ, Van Dyck DE, Tassignon MJ. 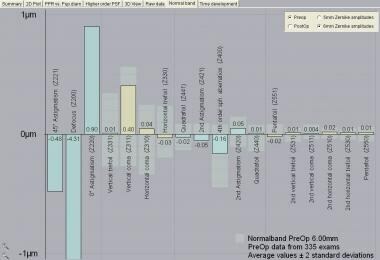 Clinical comparison of 6 aberrometers. Part 2: statistical comparison in a test group. J Cataract Refract Surg. 2006 Jan. 32(1):33-44. [Medline]. Doane JF, Morris S, Border AD. Wavefront Analysis - Clinical Primer. Discover Vision Centers. Kansas City. 2000: 1-22. Rabbetts RB. Clinical Visual Optics. Butterworth-Heinemann. 1988: 275-98. Thibos LN. Principles of Hartmann-Shack aberrometry. J Refract Surg. 2000 Sep-Oct. 16(5):S563-5. [Medline]. Wavefront maps of a highly myopic eye with minimal higher order aberrations using the Alcon/Summit/Autonomous, Zeiss/Humphrey Custom Cornea Wavefront System. Wavefront map of a highly myopic eye with minimal higher order aberrations using the Complete Ophthalmic Analysis System made by Wavefront Sciences. Wavefront map of the same but accommodated highly myopic eye (as in Image 2) with induced spherical aberration using the Complete Ophthalmic Analysis System made by Wavefront Sciences. The authors and editors of Medscape Reference gratefully acknowledge the contributions of previous author Peter Fedor, MD, to the development and writing of this article.